Rain gardens, prairie, and savanna planted over a decade ago are being brought back to life with weed management, interplanting, and prescribed fire. At Greenwood Elementary School in Des Moines, students do not rely on field trips alone to explore Iowa’s native ecosystems–they play among them at recess. In the early 2000s, the school’s outdoor recreation area was on the receiving end of 92,000 gallons of water per inch of rain. Even minor storms etched small gullies across the playground, and deposited rocks and mulch on the adjacent grassy field. Conditions deteriorated to the point that recess was often held indoors. Then, parent and neighbor Jan Berg stepped in. 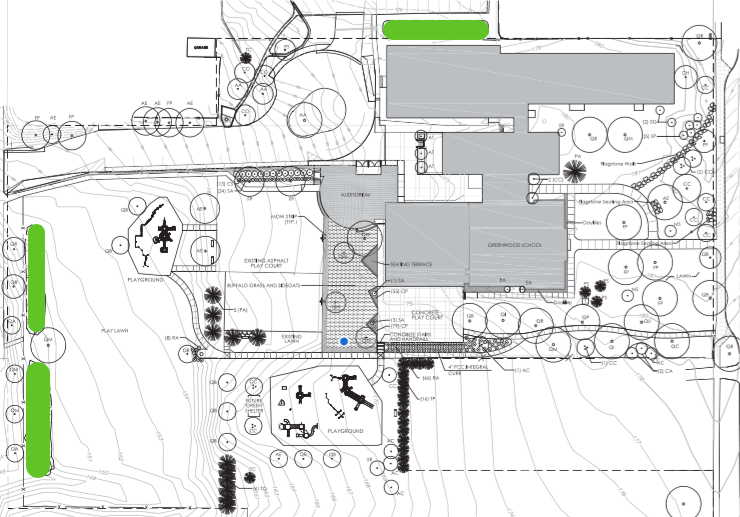 A landscaping plan from the early 2000s laid out the location of rain gardens (highlighted in green) and trees (represented by circles), among other features. Credit: Genus Landscape Architects. Jan contacted her local Natural Resources Conservation Service (NRCS) office, which recommended constructing a rain garden. To install a rain garden, a strategically located depression is excavated, and then planted with native flowers, rushes, and sedges to capture water and enable it to infiltrate into the soil. After securing funding from several entities in 2004 and 2005, Jan mobilized student and volunteer labor to install three rain gardens, protected waterways called bioswales, and several oak trees and shrubs. The rain gardens, bioswales, and savanna were incredibly successful in solving the serious erosion problem–even twelve years after the outdoor recreation area was first transformed, when Ben Coleman became president of the Greenwood Elementary Parent Teacher Association (PTA). A number of years had passed since the prairie was burned or mowed, and weeds were thriving among the native plants. Ben was propelled into action when another Greenwood parent–Bridget Ryan–approached the PTA about starting a school vegetable garden. 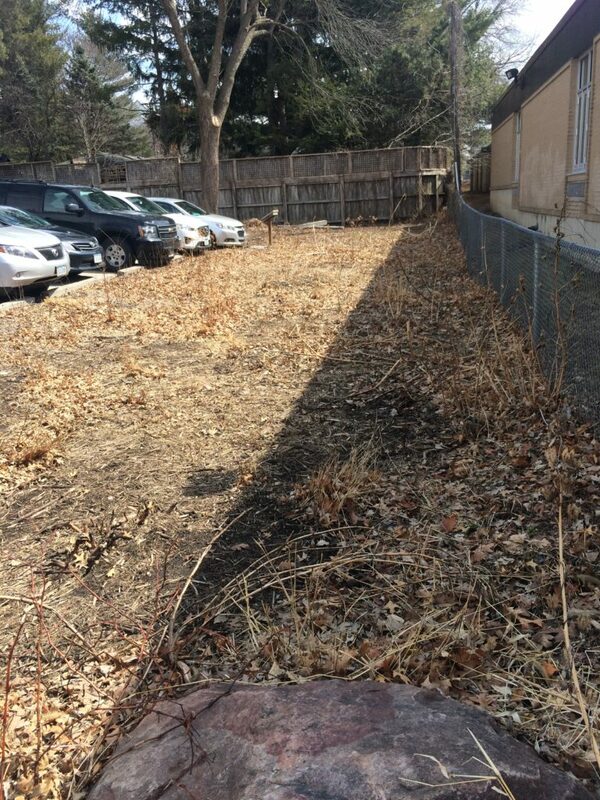 The association was initially hesitant about embarking on a new project, and pointed to the overgrown rain gardens as an example of a project that had not been maintained. “We had to earn our keep before the veggie garden got a green light,” Bridget recalled. In order to proceed with the vegetable garden plans, she would first need to demonstrate that the rain gardens could be managed successfully. The rain gardens at Greenwood Elementary are being managed to promote native prairie. Credit: Ben Coleman. Weed removal was just the first step–in order to prevent weeds from taking over again in the future, they would need to re-establish a thriving prairie. Ben connected with Patrick Bryant who coordinates the People for Pollinators program at the Neal Smith Wildlife Refuge. The program provides guidance, seeds, and plants for establishing pollinator gardens in common spaces. Patrick visited Greenwood’s rain gardens, and recommended that they increase native plant diversity to discourage the weeds. He explained, “Once prairie plants mature, they form a nice dense mat that excludes most weeds from taking root. Plus, they are already adapted to Iowa’s climate and support native pollinators.” To help launch the restoration, Patrick supplied the school with diverse mixes of seeds and plugs. 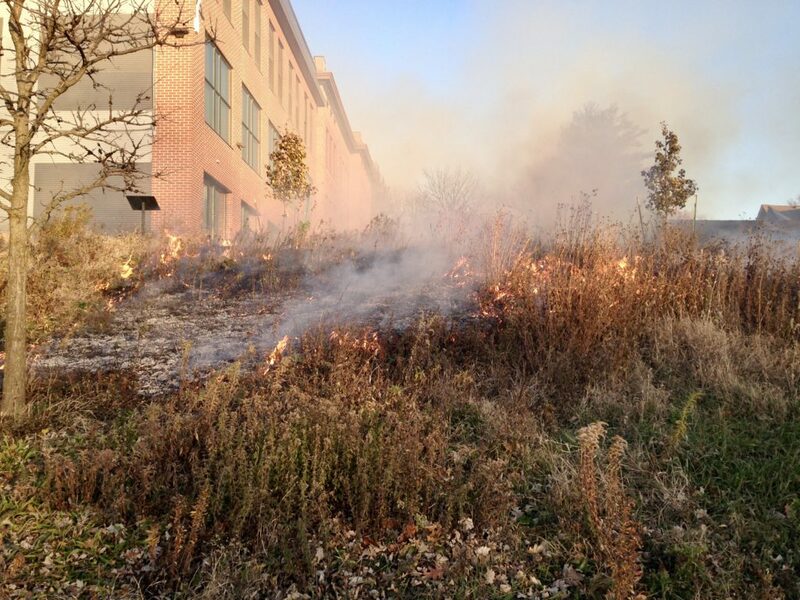 A prescribed burn conducted in the fall of 2017 helped reinvigorate the savanna (pictured) and rain gardens. Credit: Leland Searles. 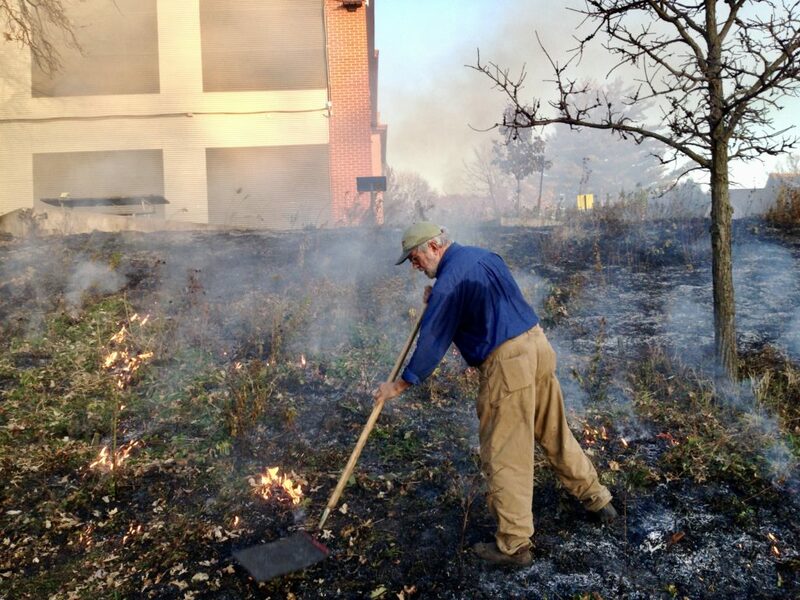 Once the plugs were in the ground, Ben’s thoughts turned to the prescribed burn–a vital component of minimizing labor during restoration. Improved seed-to-soil contact would enhance germination of the seeds that he would be broadcasting come spring. 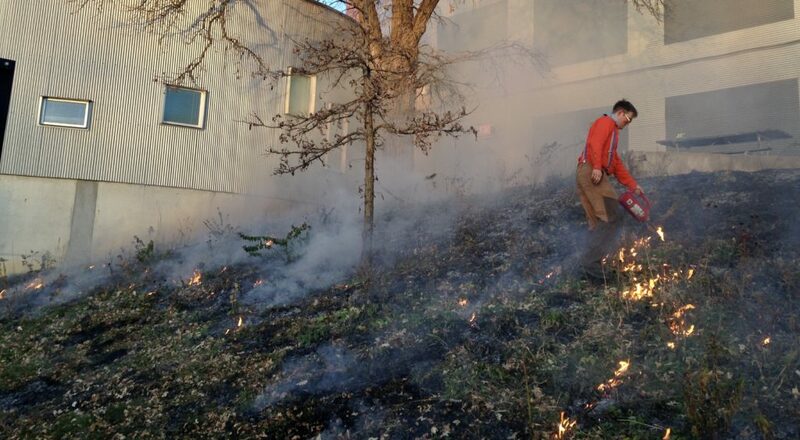 He began calling his way down a list of prescribed fire professionals, and discovered that it was surprisingly difficult to find one to conduct a burn in the city. “We had been looking for a burner for awhile. 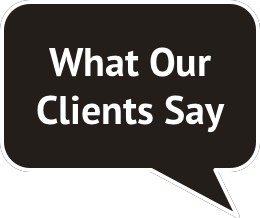 A lot of them said, ‘That is too small–we just do farms.’ ” When Ben contacted Prudenterra, he was relieved to learn that the company had significant urban prairie burning experience. 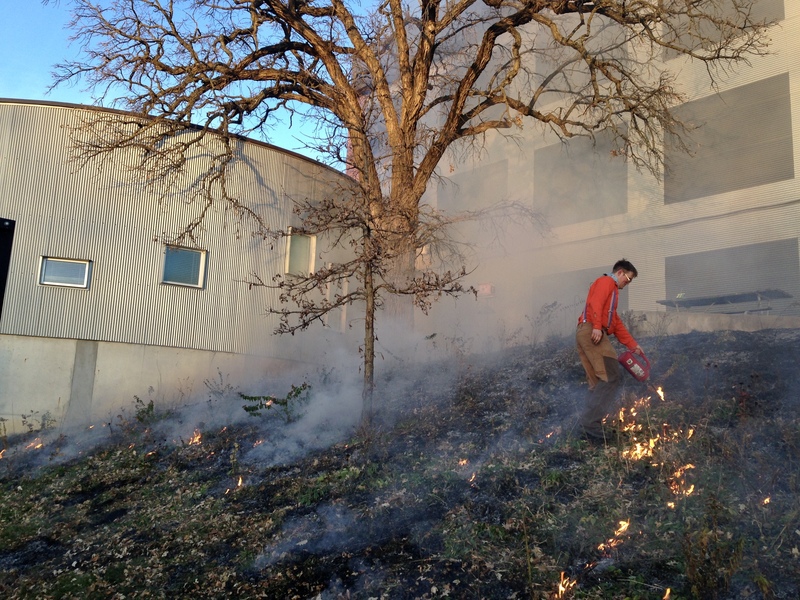 On a clear afternoon in late November, Luke and Lee from Prudenterra used a drip torch to carefully ignite the prairie. They added oak leaves from the parking lot to augment the fuel load in areas that lacked fine grasses. Ben, Bridget, and other members of the garden committee hope this will be the first of many planned disturbances. They have arranged for the school district to cut the prairie during the critical first few years, followed by regular prescribed burns. A collaboration between parents, the school district, and local organizations and businesses is enabling the prairie at Greenwood to thrive once again. Once the prairie and savanna areas are better established, the garden committee hopes they might facilitate a more robust nature curriculum. In the coming school year, staff from Neal Smith will be guest teaching fifth graders about the interactions between pollinators and the native prairie plants growing around the school. Bridget hopes that resources like Teachers Going Green will soon enable all of the school’s students to experience the rain and vegetable gardens as outdoor classrooms. “Building community around a project makes you feel like you are part of something, and gives you a sense of belonging,” Bridget observed. With students, teachers, and parents awakened to their playscape’s extraordinary value (and what it takes to maintain it), a future rehabilitation is far less likely to be necessary.